Currently, I am a Doctoral student in Physical Therapy. In a Pediatric Rehab class, we learned that for treating children, the most important thing to provide is a proper level of stimulus to a child’s brain. Children (and adults) are very sensitive to levels of stimulation. Now we must understand that stimulation can be many different things. Reading words on pages of a book is a stimulus. Sitting down and thinking about something is a stimulus. Listening to music, background noise from a TV or a lounge, the noise of traffic, physical movement, flashes of light, people walking in and out of a room… these are all considered as “stimulus to the brain”. For Pediatric Physical Therapy, we must keep our patients in an optimal level stimulation in order to get the desired response and best treatment outcomes. This is how it works. For everyone, there is a range of stimulus that we can tolerate. If we are given too little stimulus, we tend to space-out and fall asleep. If we are given too much stimulus, we have nervous breakdowns. Someplace between these amounts of stimulus is the “optimal stimulus level”. It is at this optimal stimulus level where the children can perform to their highest level – both mentally and physically. This encompasses their studies, sports, social activity, daily habits, hobbies, everything! For some children, you can only give a little bit of stimulus. If you give too much, the child will be overloaded and will seem confused, irritable, and very frustrated. There is simply too many things (stimulus) for this child to focus on their brain cannot process that much stimulus. For others, like many in our ADHD population, you must give seemingly overwhelming amounts of stimulus before the child is satisfied and can work at his or her “optimal stimulus level”. As you remember from my “jars of marbles” analogy, it is very possible that a person with ADHD has enormous amounts of attention slots. If these slots are not filled, it is a very irritating feeling to be under-stimulated. This is why many ADHD children like to walk around the class, do many things at once, or become “destructive” – they are simply trying to fulfill their hunger to be mentally/physically stimulated. This is a good thing! Stimulation is the key to learning. We further learned in our class that sometimes the best way to get a child’s attention who seems distracted is to give them physical stimulus. 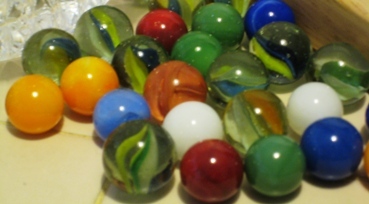 Having them stand on a trampoline, sit on a swing, or sit on a large therapy ball gives them a swinging or bouncing sensation – this sensation is a very important stimulus that adds just enough “marbles to the jar” to get them to focus on the therapy session – and much of Physical Therapy for kids is educating the child through activities and play, much like the environment at school! When we heard this in lecture, many of my classmates turned around and looked at me & smiled. This is because some of them know that I have ADHD. They also know that since day 1 of the program, I have had very strange study habits. I don’t really take notes, sometimes I fall asleep in lecture, and when I actually study – I gather a handful of lecture handouts and I literally walk around the entire college campus holding the notes to my face while I read them and memorize them. Most of them thought I was CRAZY. How can anyone concentrate when walking around? How can anyone even read or remember what they read while they walk around campus – dodging people running in and out of the cafeteria, avoiding crowds going in and out of classrooms??? It made no sense…. Until now!!!! NO WONDER! Just like I said with my “marbles in a jar” analogy… I require stimulus! I will go crazy without filling up my marble jar! We tried to fill it with medication at one point. Ritalin, is a common drug to treat ADHD, it is a stimulating drug but it is one that stimulates by affecting brain chemistry. I personally didn’t like it. But this is just me personally – the medication may affect every person in a different way. But apparently, my body and mind found a natural way of stimulating my mind to my “optimal stimulus level”. By walking around campus, dodging other college students running around, and studying at the same time – I gave my mind enough stimulus that I could actually and quite effectively concentrate on reading. If I simply sit still – I can promise you I wouldn’t be able to read more than a page & I would’ve failed out of my Doctoral program. So I have a suggestion. It may seem silly at first – but we use this at the Doctoral level of Physical Therapy and Rehabilitation here in the United States – so it must be doing SOMETHING right! =) … Perhaps, many of us ADHD people need that extra healthy stimulus. Maybe if we are given a bouncy ball to sit on while we do our math problems or are allowed to walk around the house while reading… we will be able to function at our optimal level. Many times, we are scolded for moving about so much – but it is simply our cry for help! We are starved of stimulus. We want to learn! But we cannot learn without the proper level of stimulus. For most normal people, the amount of stimulus we require will drive them crazy! For us, it is just perfect. It is like spice for beef noodle soup. Some people need only a little, others might as well cook their noodles in hot sauce. =) Our brain needs hot sauce… a LOT of hot sauce! Let us work together to come up with creative ways to give us our hot sauce so we can learn and be productive as a team!